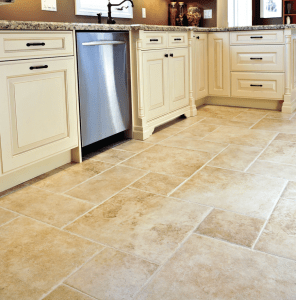 Why Should I Invest in Tile Flooring? When it comes to the type of flooring you can put into your home there are many options. There are so many different options with all their pros and cons that it can be an overwhelming decision for someone building a home or remodeling. Here are a few of the reasons why tile flooring is a great option. Tile flooring is one of the most versatile types of flooring out there. Ceramic and porcelain tiles are typically the best choice when looking for maximum versatility. The tiles won’t just stay in good condition if you forget about them though. Take care to clean them often and keep them in good shape and then you can count on your tiles lasting you a long time. It is a nightmare when items with staining potential are spilled on carpet flooring. It’s a constant threat. For tiles floors, however, stains are much easier to clean and create less of a headache. An important aspect of keeping your tiles stain free is making sure they have been glazed. Once they’ve been glazed they will require little maintenance and withstand just about anything that gets spilled on them. Believe it or not the type of flooring you have can actually impact your health. Tile is fired in high temperature kilns; thus it carries with it little to no volatile organic compounds like other types of flooring may have. These volatile organic compounds or VOC’s can lead to a wide array of health problems. There are numerous types of tile you have to choose from and ways to design the type you choose. Some of the different kinds of tile are ceramic, porcelain, non-porcelain, and natural stones such as marble, granite, limestone, travertine, and slate. You can choose to put whatever type of tile you choose almost anywhere throughout your home with a wide array of colors, designs, and shapes available. Although tiles flooring is a fairly reliable type of flooring it still breaks and cracks on occasion. Fortunately, the steps to repair it are very simple. It’s as straightforward as this: Remove the broken pieces, clean the area, reinstall a new piece or pieces of tile, and regrout the affected area. This is a much quicker process than it is to fix damaged wood or even composite flooring. In essence, tile flooring is a fantastic option for any home. It will last, it won’t require tons of maintenance, it’s healthier than other flooring types, there is a wide variety of options it offers, and it is easy to repair. At Made New Again located in Pearland, Texas, we are a cleaning and restoration company devoted to helping you keep your tile flooring in tip top shape. So once you get your beautiful new tile flooring installed make sure to call so we can help you keep it looking like it did when it was brand new.